After many Christmas and New Years proposals, January is always a busy month spent meeting with couples to plan their wedding day. We only accept two weddings over any weekend, so dates fill quickly. Many couples ask us about our consultation process, so let’s talk about it briefly. We are a custom florist, meaning we do not design from a printed illustrated selection guide. Our work is designed specifically to meet your needs. We have an exceptionally wide network of growers and importers we work with to procure our flowers. This assures you’ll get the freshest flowers. After we meet and discuss your interests and offer you ideas for the big day, we follow up in the next day or so with a complete proposal for the items we discussed. All the costs will be listed including tax and delivery and rental fees. We place a temporary hold on your date for 10 calendar days from the date we email you our proposal before releasing the date to other couples. We ask for a deposit of 50% of the proposed total to secure the date, with the balance due in full 14 days in advance of the event. 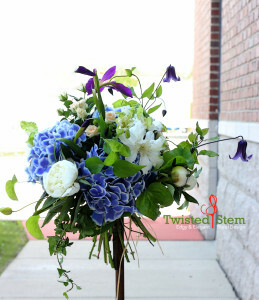 Give us a call if you’re newly engaged and see why we’ve been selected the last four years as the top wedding florist in Mchenry County as voted by readers of the Northwest Herald.